Sometimes when you are reading comics, all you want is to sit down with a nice cup of tea and crack open a classic from your childhood. If you don’t have access to one of your childhood books, this issue of Looney Tunes published by DC will do just the trick. The comic is separated into four stories: one feature, one backup and two one page gags and all bring found memories of watching these zany characters on Saturday AND Sunday afternoon TV while more than likely munching on something that would be ruining my supper. We start off with Cohen, Gross and Temofonte bringing us, and I’m not kidding here, a Westworld parody involving as our leads Elmer Fudd and Daffy Duck. I’ll be honest, I’ve only watched a few episodes of Westworld, but even to the casual fan, you can see some of the links to both stories. It’s also one of those instances where, I can only imagine a kid reading this comic and then watching Westworld when they are older, because let’s be honest, that show is definitely NOT for kids, and making the connection. 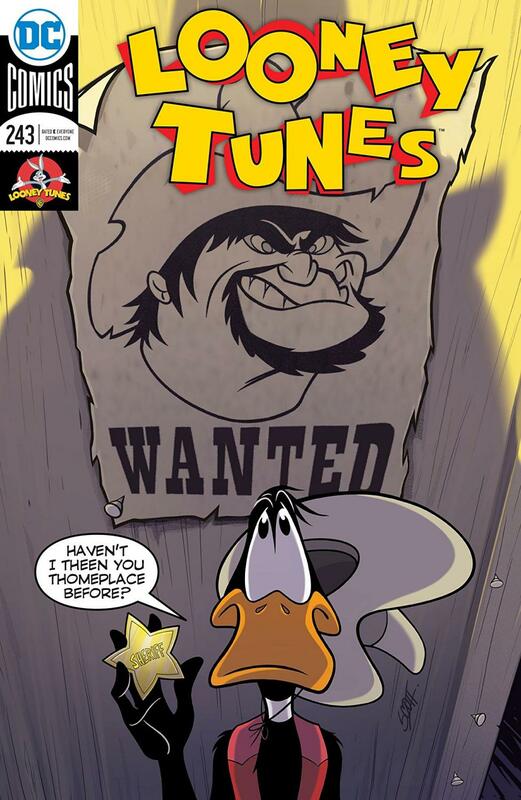 All the characters used are recognizable in the parody and are used well, even if in a limited role - Bugs, Speedy Gonzalez and Yosemite Sam are used sparingly, but effectively for their own one-shot gags. However, it’s still Fudd and Daffy that get the best gags, as it should be when they are the leads in the story. Scott Gross does a wonderful job with the art with just the right amount of zaniness to each panel and great use of color throughout. The two one-page gags are classic-style Looney Tunes and gave me a chuckle, which is exactly what they are there for. You can’t ask for more really. Finally, the backup this month sees Sylvester the cat try his darndest to prevent Granny from delivering a cake to their new neighbours. Why you may ask? Because it’s Gossamer and his family of monsters that have moved in next door and Sylvester, well, I think he’s scared of them. This could have easily been a one-page gag, but Chuck Kim makes sure to stretch the joke just long enough to not overstay its welcome. It’s again, pure fun, and a joy to read.